I’m excited about this! Are you? For our first challenge, I’m gonna break you in easy. This one is not difficult, and it’s fun. It doesn’t make you think too hard — in fact, it’s actually quite relaxing! The dictionary defines “doodling” as the act of drawing or scribbling idly, or to “scribble absentmindedly”. 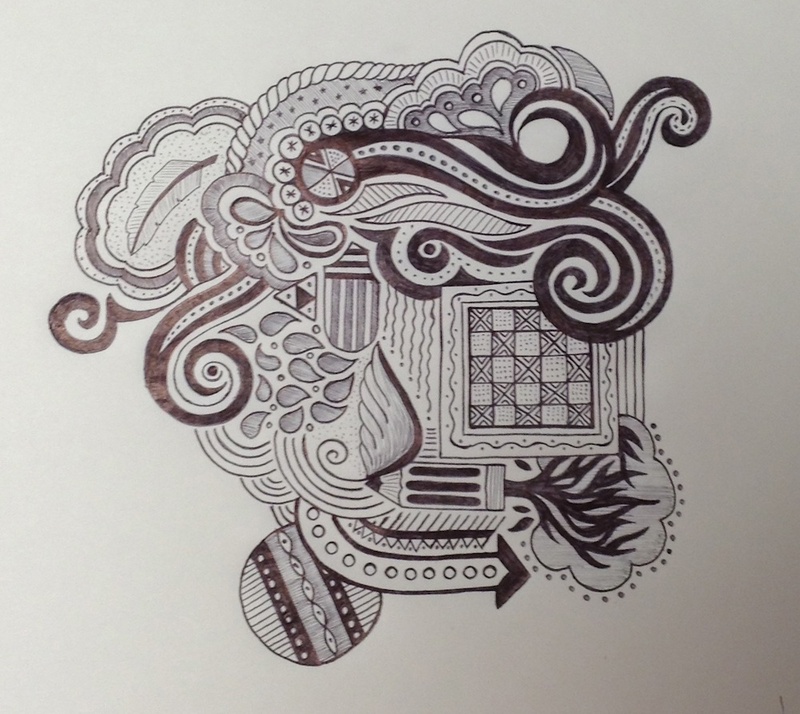 Doodling is seen as therapeutic. Experts proclaim it to be a wonderful tool for facilitating thinking, exercising the brain, and expressing spontaneous ideas. It also helps to improve focus and memory. It’s a great thing to do when you’re stuck waiting, or when you have a few idle moments to fill. It’s also something you can do with your kids — they can join you, and they’ll think it’s fun! I pretty much always have a sketchbook of some sort with me everywhere I go, and when I’m not making lists, writing out notes, or working on an actual quilt design, I’m doodling. For this project, however, I started a series of new doodles. I wanted to try several different doodling utensils. I’ll show you the ones I’ve done so far. I won’t be finished with this doodle until the paper is completely filled, so I’m going to continue working on this one for as long as it takes. I’ll post updates along the way as it grows, so you can watch its evolution. My third one stems from my desire to write on walls! I’ve drawn and/or painted on my walls my entire life. When my dad boarded up a window in the bedroom I shared with my sister during a remodel one summer, I painted a mural on the temporary board. In my first college apartment, my roommate and I both painted murals on the walls (and promptly forfeited our security deposit — well worth it!). In the studio we built onto our shack before we moved, I painted a mural on the floor. My Cowboy has asked me where I intend to paint murals in this house — I haven’t completely decided yet, but there will probably be at least one — I just can’t help myself! In my studio, my longarm room has a blank wall that’s easy to stand in front of. I had planned to paint it as a whiteboard surface, so I can draw directly on the wall with dry-erase markers, but I haven’t done it yet (but still might). 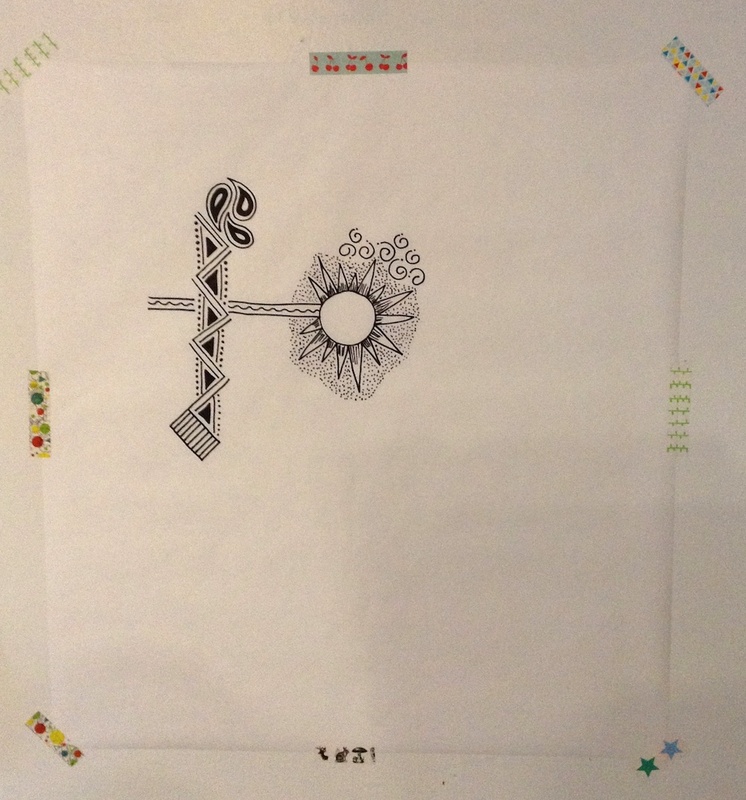 Meanwhile, I taped up a piece of freezer paper (18″ x 20″), and am doodling on it with a Sharpie Fine Marker (black again). I hung the marker right beside it, so I can add a few doodles every time I’m by it and have a few minutes (talking on the phone, waiting for pictures to upload on the computer, waiting for dinner to bake, water to boil, paint to dry, etc.). When it’s done, I can take it down and put up another piece. Maybe someday, I’ll just start doodling directly on the wall and fill it up! Who knows? I chose black to start with for all my doodles, but you can use whatever color and whatever type utensil you want to for yours. I may add some color to some of them later on. I’ll just have to see how they evolve. It’s important to remember that doodling does not have to be perfect. I’m doing all mine freehand, without using any aids like rulers or templates. That’s what I want you to do, too. Just doodle without worrying about it being perfect. If you make what you think is a mistake, incorporate that mistake into your doodle. I’ve done it already many times on the ones I’ve shown you, and I’ll bet you can’t tell it! Above all, don’t compare yourself to others. You will have your own style, and your doodles will look different from anyone else’s. They should! As you doodle more and more, your confidence and ability will increase, and you’ll be much more comfortable with it. There are NO wrong doodles. Trust me on this! So go get started doodling. Spend just 30 minutes for certain, and don’t think you have to finish your doodle in that 30 minutes. Leave it, come back to it, keep adding on to it, start more than one. And don’t stop! Keep doodling throughout this entire challenge — we’ll be doing a few things with some of our doodles along the way. So don’t let this be the only week you doodle. I intend to spend some time at it nearly every day. I hope you do, too. You might just come up with lots of new ideas based on the doodling you do. Something that can translate into your quilting life — a new pattern, a new quilting design, an applique motif, whatever. 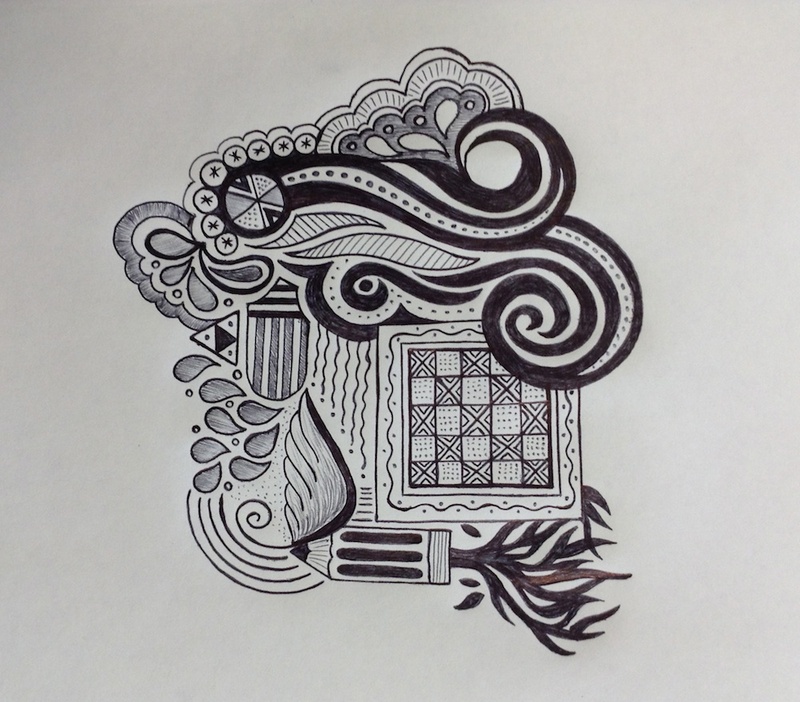 Your doodles should free your mind and inspire you! Here are a few links to help you get started. Then grab your sketchbook and your utensil of choice, and get started! I’d love to see what you’re doing as we go along. If you have a blog and post about it, please leave us a link in the comments. If you’re on FaceBook, Pinterest, or InstaGram, etc., leave us your info so we can look you up! And before we go, I need to announce the winner of the coloring book! Congratulations, Randy! I’ll get it right out to you so you’ll be ready when that challenge comes along. Thanks so much to all of you who are willing to jump into this with me. I think we’re gonna have a lot of fun! You are so talented, Shelly, which I already knew. I now realize your artistic abilities. But I know that doodling with a purpose helps develop motor skills for longarming do this is I one exercise I will do. And don’t scoff at the compliment. I know you! Fantastic! I doodle! I also color in those wonderful coloring books. In the beginning was the Word!! Just sayin’. I am still here just sinfully behind on everything. Working 7 days a week is taking its toll! yikes I feel for you. I like to doodle, but I don’t ever have anything as beautiful as yours. I won’t compare myself. I’m impressed with your doodles. My DD is going to join us. Oh seriously, I’m already intimidated. And, that is why you are the artist!!! I haven’t doodled since I was a kid. I’m with Cindy; I’m already intimidated. But in looking around my house for the supplies, I have them all, mostly unused. It’s time to do something with them, so I shall try. Plus my 7 year old, who is always doodling, told me “you can do it, mommy! just try!”. 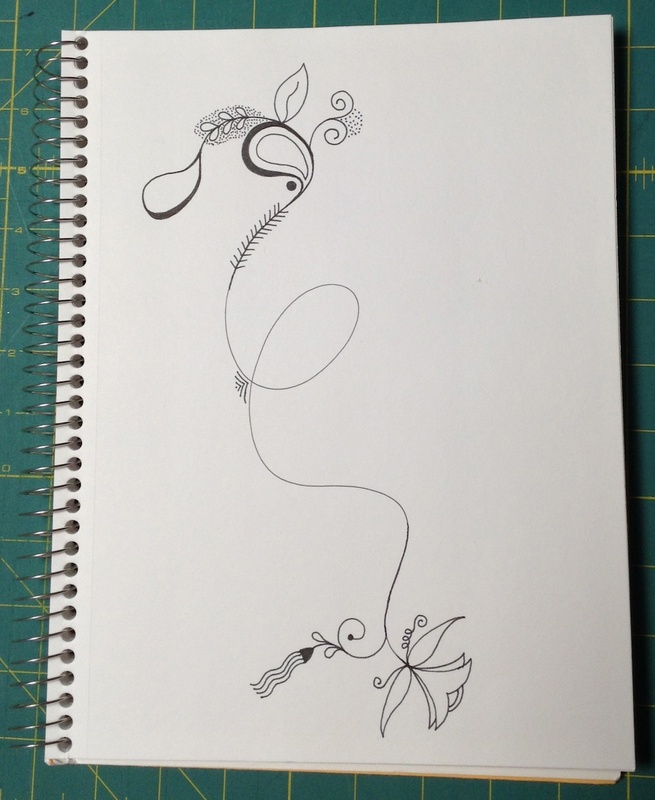 OK this is new for me – I can’t ever remember doodling. The most I do is trace the lines on paper when I am in meetings. When I was in school I refused to take art because it was the only class I could not get A’s in. I put some paper by my chair in the living room last night and plan to doodle some tonight. I will tell you how it goes. WOW…you are very creative! The most creative I have ever done is drawing smiley faces when doodling. ‘Hi Shelly, I just love doodling. Sometimes the doodle covers the whole page but last night I left some negative space around my doodle. Enjoyed playing along with this challenge and I think I might end up doodling some more this week. for get the not sure how to end it…not a clue where I was going with that. Shelly, you are so talented in all that you do! I’m excited to participate in this year’s challenges. I’ll probably post on IG. Is there a certain hashtag you’d like us to use to share our progress each week? Happy New Year! My hubby gave me a really nice doodle coloring book for Christmas, just the kind I wanted, plus a great set of pencils of all kinds in a two-tiered case, including water color and chalk pencils. It’s so organized, everything in one place, I’m thrilled! So I will be coloring and doodling, since my book also has blank pages for that purpose. I used to doodle when I was younger…it’s so relaxing and fun. 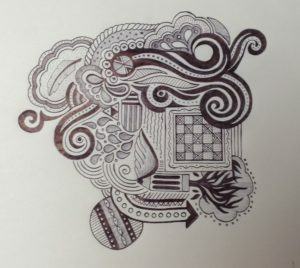 I love your doodling! Always have. I remember many a staff meeting where you’d be listening to what was being said (or were you?) and you’d be doodling all over your notes. Most days there were more doodles than notes! And I know several quilt ideas came out of those staff meetings over the years, too! Do you still have those notes/drawings somewhere? My journal and pens are by my chair, ready to go when the moment strikes me. Planning on doodling while watching football later today. 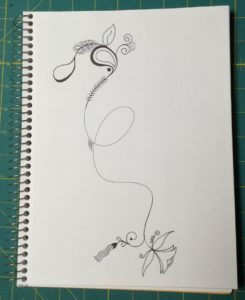 It’ll be interesting to see if the style of doodling will change from an “excitable” environment (football) and a “quiet” one (no tv, but music in the background). Your doodles are beautiful. I’ve done one and posted it at my blog, Food for Thought. Have a great day!